Bei Think Monday – Think ATC & More sind diese Woche Leuchttürme gefragt. Und bei Craft a Scene geht es sogar den ganzen Monat ums Thema Strandleben. This week at Think Monday – Think ATC & More it’s all about lighthouses and at Craft a Scene the theme for the whole month is “By the sea”. Was Roald Dahl wohl dazu sagen würde? 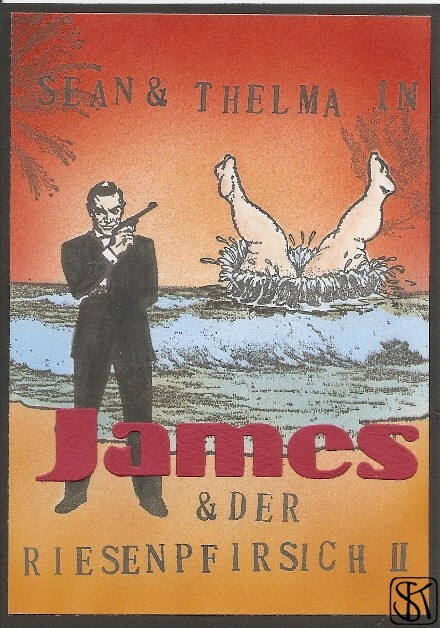 Roald Dahl hat nicht nur das Kinderbuch “James und der Riesenpfirsich” geschrieben sondern auch das Drehbuch zu meinem Lieblings-Bond “Man lebt nur zweimal” (der mit dem bösen großen Raumschiff, das aus einem Vulkankrater startet und andere Raumschiffe “auffrisst”). Tja, und wenn man die beiden zusammenmixt, könnte vielleicht sowas hier dabei rauskommen. Wobei die Frage offen bleibt, wo im Bild sich der Riesenpfirsich befindet. Grins. Und weil bei Craft a Scene diesen Monat Strandszenen gefragt sind, finde ich, dass diese Karte doch ganz gut passt. Roald Dahl did not only write the famous childrens book “James and the Giant Peach” but also the script for my favourite James Bond-Movie “You only live twice” (the one with the big bad space ship coming out of a volcano and “eating” other space ships). Well somehow those two got mixed up for a sequel and this is what came out of it. Feel free to guess where the giant peach is hidden in the picture. Grin. As this month beach scenes are called for at Craft a Scene, I decided to go for it.